Through developing, producing, and distributing a film, special-needs and mainstream students can work together, developing communication, critical thinking, and problem-solving skills -- among many others. Seth Shulman is a staff editor and post-production supervisor at Futures Explored Practical Film & Media Workshop in Sacramento, California, one of four film production workshops where film director Joey Travolta serves as a consultant. Elliot works as an assistant editor and classroom aide with Futures Explored Livermore Film Workshop. Jordan, a regular camper at Travolta's Short-Films Camp, is now a freshman in college. All three, diagnosed with developmental disabilities, were part of the special ed system. All three attribute much of their success to the arts, especially filmmaking. Filmmaking has a transformative effect, especially on kids with special needs. 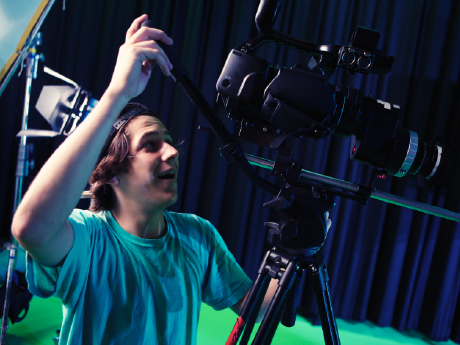 Studies indicate that students involved with art forms such as filmmaking do better in academics and life in general, and this experience seems to be crucial to a student's overall success. Why is this so? In her blog post How the Arts Unlock the Door to Learning, Mariko Nobori writes, "Arts integration uses teaching practices that have been shown in brain-based research to improve comprehension and long-term retention." When students create original stories through film, they're creating new content from prior learning. This is known as metacognition, and Bloom's Taxonomy ranks it as the best possible learning outcome. Joey Travolta takes it a step further. Filmmaking (also including video production) becomes a vehicle of transfer. Learning outcomes developed in the filmmaking process -- problem solving, critical thinking, collaboration, and pitching -- benefit kids in many other aspects of life. “Filmmaking in the classroom can also foster awareness and passion, and that passion fuels action," according to Nikos Theodosakis, author of Director in the Classroom. "It gives students a chance to ask questions of [their] subjects. . . and at the same time, to answer questions for themselves." More importantly, it can lead to an atmosphere of inclusiveness, an environment where special-needs and mainstream students can work together on a single vision. For Dan Habib, University of New Hampshire filmmaker and appointee to the President's Committee for People with Intellectual Disabilities, educational policies and initiatives that more fully integrate all students within the same classroom environment are sometimes more beneficial than special education alone. A teacher who wants to integrate filmmaking into the curriculum doesn't have to be a Joey Travolta to make the experience meaningful and generative. Educators who want instruction or guidance can find it through online workshops (see video below), through digital storytelling initiatives, and through educational partnerships with the filmmaking community. In addition, portable digital video cameras are user friendly and affordable; and editing software such as Microsoft Movie Maker is relatively inexpensive, sometimes free. How might the filmmaking process in the classroom look? This is the planning stage. Students map out the progression of the film with storyboards. Group members are assigned roles, tasks, and deadlines. Students begin script writing, a process that integrates writing, role play, and dialogue. Learning outcomes of this phase include expressive language, role play, nonverbal communication, and sequence. Students start filming, gathering images and audio for the final version. This stage builds digital literacy. It also teaches students how all the parts -- the planning, storyboards, and sequencing -- come together, and how all ideas are essentially represented in a cohesive vision. Learning outcomes include digital literacy, spatial orientation, lighting, timing and transition, sequence, role play, and critical analysis. This is the editing phase, when all the clips are put together in an order that gives the movie sense and meaning. It's where students can add audio, animation, and special effects to make the movie look and sound better to the audience. It's also when students watch the movie in the way an audience might, when they can see if the message or theme is conveyed in a meaningful way. Learning outcomes can include sequence, digital literacy, critical thinking, organizational skills, and problem solving. For an example of a student production, watch this interview with Ruby Bridges. If students have planned a showing to peers, this is where they learn about public relations, advertising, and distribution. This is also where they learn how to pitch their work and promote themselves, skills essential in the adult world. Learning outcomes include interpersonal communications, pitching, and problem solving. Filmmaking serves as a vehicle of transfer, a way for learning outcomes to be transferred from the filmmaking process to other aspects of life. Its process encourages meaningful, content-rich, student-driven learning. It's also a platform by which special-needs and mainstream students can work together in an inclusive environment and certainly a medium that educators should consider not just as an initiative, but as an investment in the future successes of special-needs students.